I decided today was a good day for a blog post. I just finished writing a very wordy tutorial and it left me in the mood to post something photo heavy! Fair warning, this post will be a little different then usual, since it’s centered around sketches i’ve done. 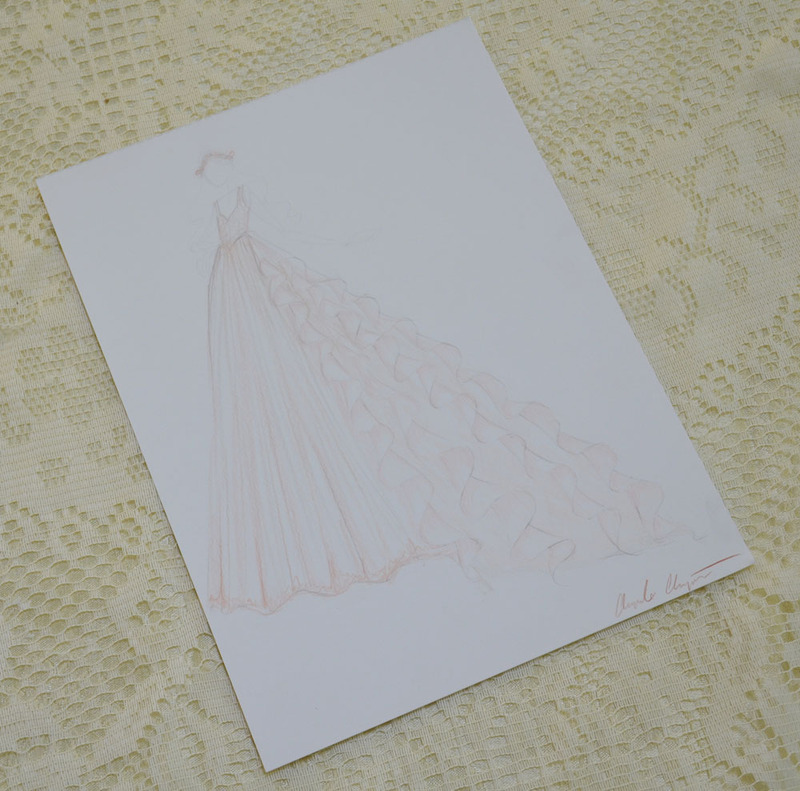 A month or so ago I was contacted by a bridal store and asked to collaborate with the owner to create a mini collection for Fall. You may recall me posting about some exciting news a while back, well, this was it! I was super excited and worked hard to create six designs that I was happy with. The owner seemed to like them too, but due to budget constraints the collection was delayed. Now it’s been a few weeks without contact so it seems like these designs will never be more then sketches. I’m sad, but still proud of the work I did, so I wanted to share it! The goal was to create a fantasy inspired collection that was wearable and filled with unique touches that aren’t really found in existing bridal wear. 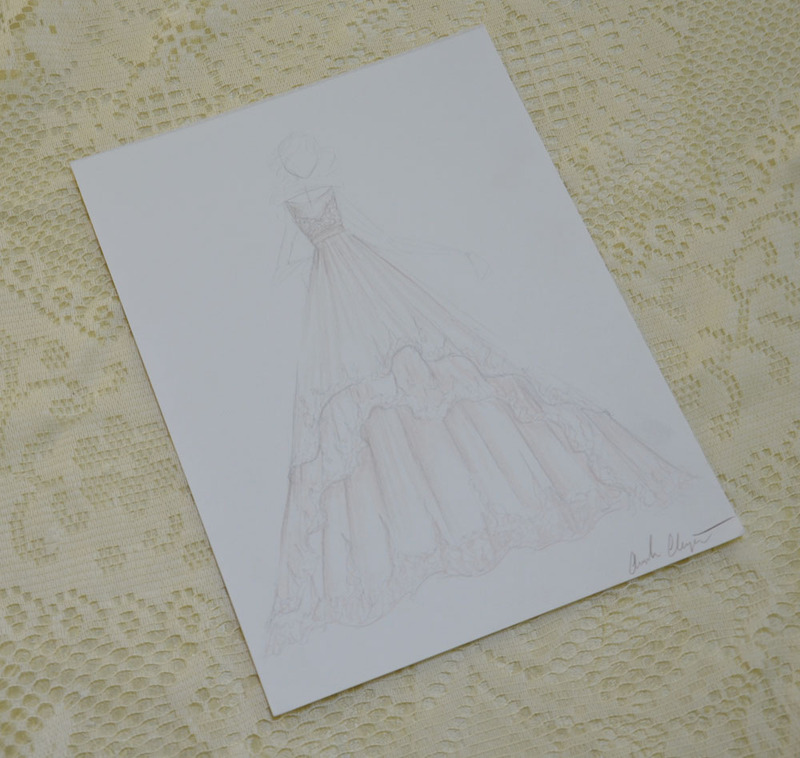 The dresses are all designed to be very structured and intricately seamed but soft at the same time. 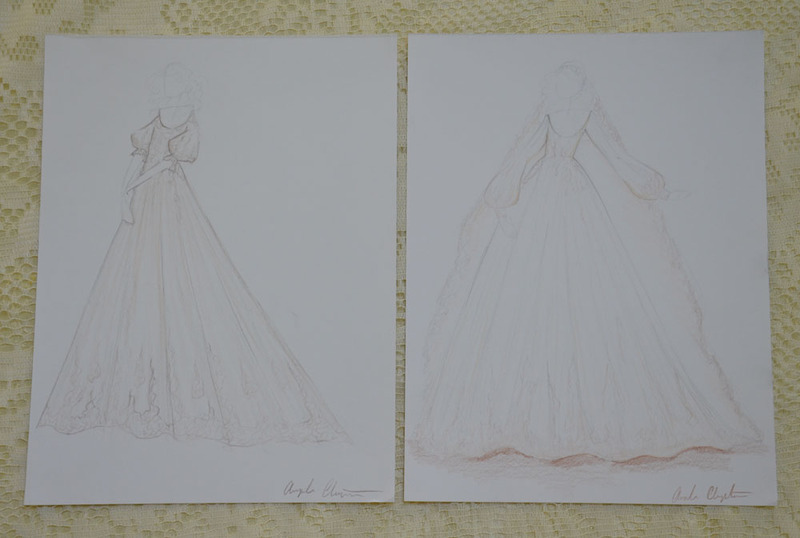 I wanted to merge traditional silhouettes and modesty with something more modern brides might be interested in. 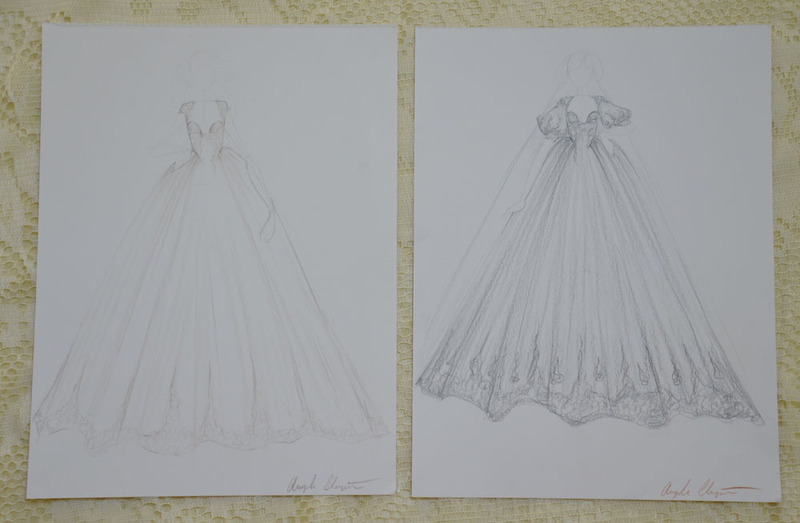 I picture them all made from a lightweight brocade, layered with silk organza, english net, and a lot of lace. I tried to design them in pairs but also keep a cohesive look to the whole thing. My favorite one is the black one since it’s so daring! Before I get into the colored sketches here are a few WIP’s. This was the first dress that I designed, and I think it’s my second favorite of the bunch! 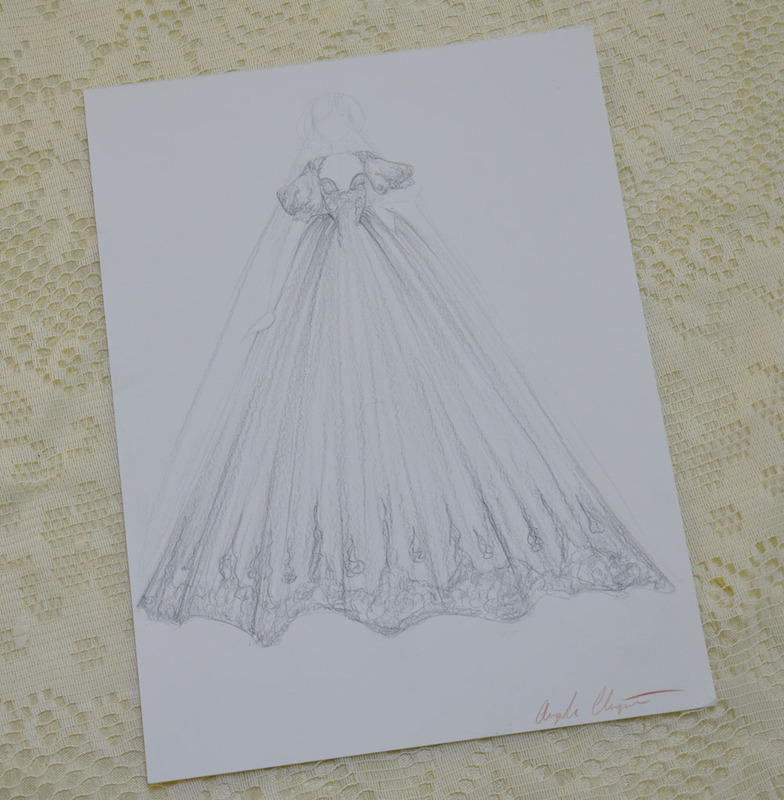 The companion piece to this was a slightly slimmer fit gown made from the same materials, with shorter sleeves and a longer train. After that is my favorite one – the store owner requested a black dress and though it took me a little while to come up with an idea this eventually became my favorite! 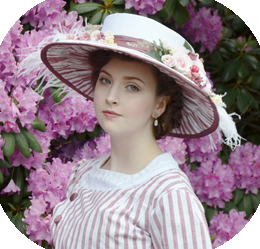 The companion piece to this is a very similar dress, just made in ivory without sleeves. 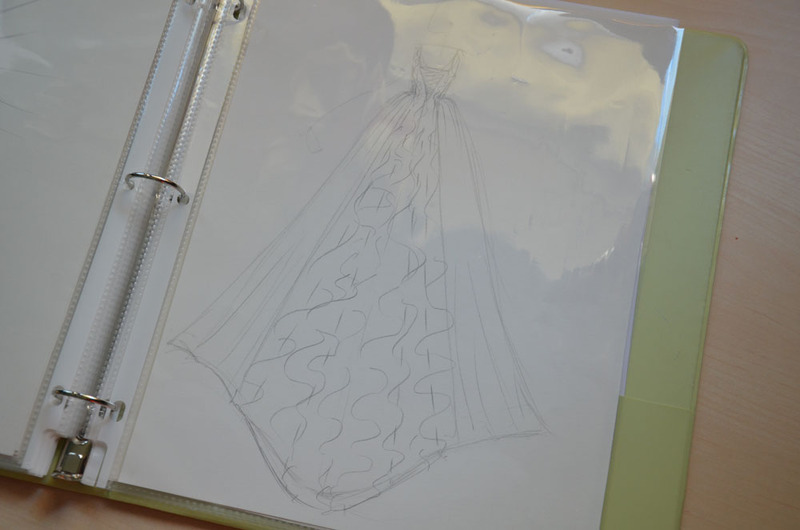 The last two were built to be more modern, this one would have had a detachable skirt. 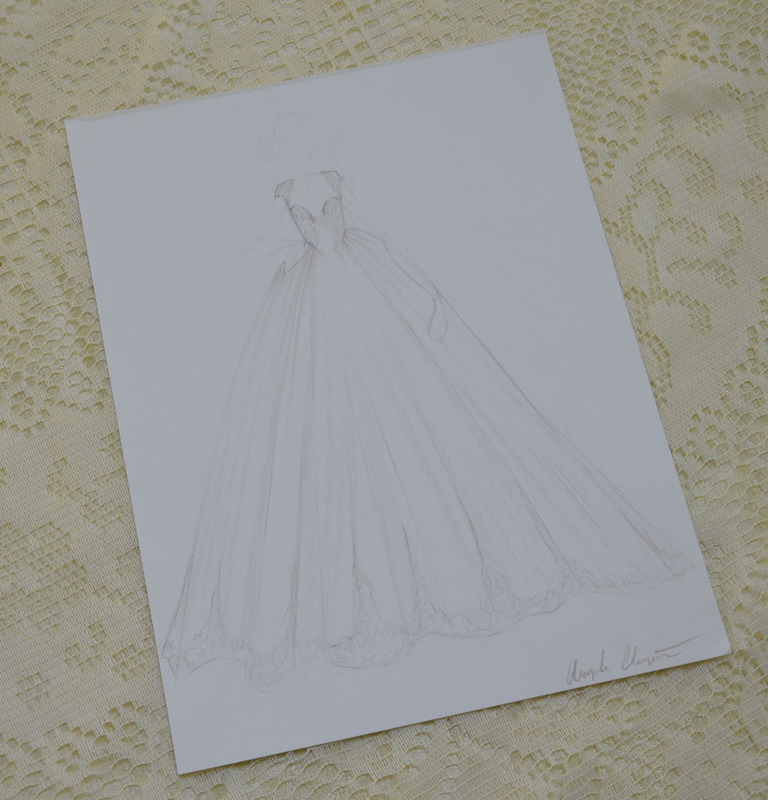 And this one is a very simple princess style dress in the front, with a flounce explosion in the back. 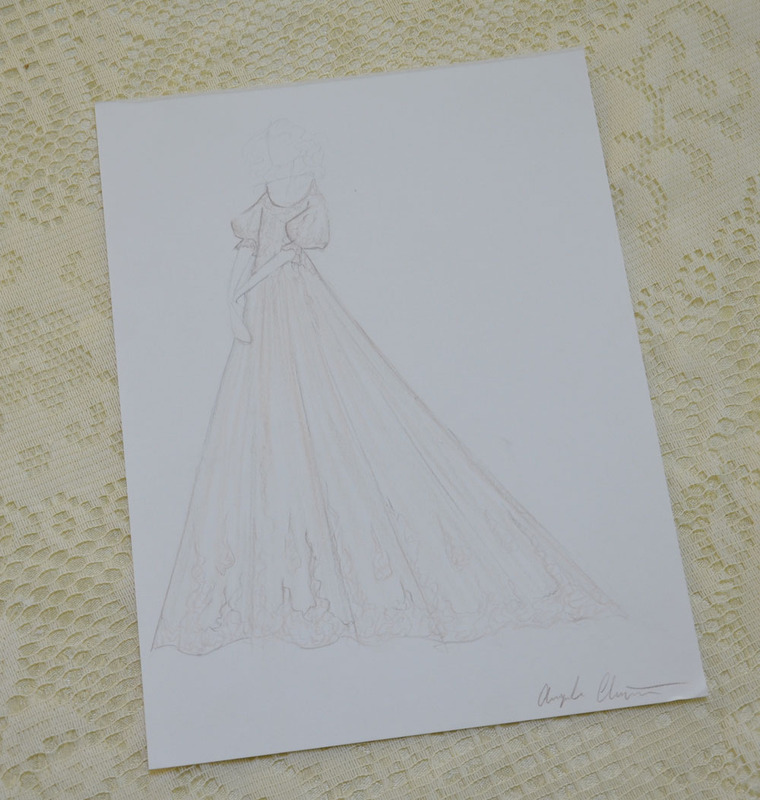 I wanted this one to be made in a peach color with a lace covered bodice. 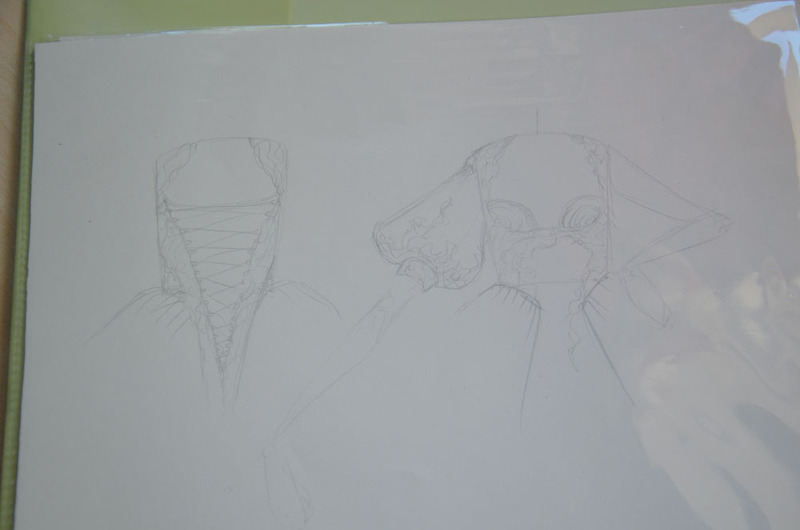 In addition to creating all of those sketches, I also did loose sketches of the bodice fronts and backs, as well as full body images of the dress backs. I think in total I did maybe thirty sketches? It was certainly an interesting process, and I learned a lot. It’s really unfortunate I won’t be able to move forward on this project. Maybe some day i’ll have the money to fund it myself. Thanks for at least trying to break out of the strapless A-line trend. These look gorgeous. Thank you! I guess the world isn’t ready to leave ruched white dresses behind just yet. I suppose not. Pity. 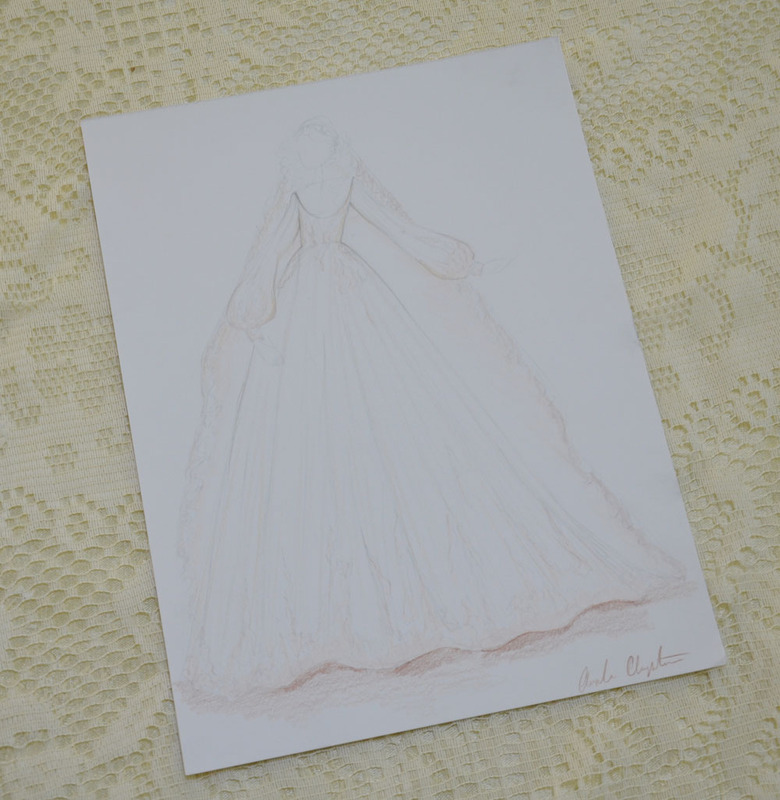 My wedding dress was from a Josephine Bonaparte costume pattern. I was the oddball in a long line of weddings that year. From a business type just keep an eye on your possible business partner. They may take your design to someone for build without giving you credit for it. Very much aware of that, but unfortunately there is nothing I can do at this point. I have proof it’s my work and hopefully that will be enough to protect me if it comes to that. You can always look at the positive side, in the worst case you can still take credit for the finished product as the designer 🙂 BTW – you do great work, I’ve been very interesting following your work. Ah, unless they mess them up! Without my design notes I doubt the end result would be anything like I had imagined. That sounds a little bit conceited but oh well. Angie, you are such a talented designer!! I enjoy seeing all your work. Definitely fund it yourself or find a sponsor, excellent work and would love to see this as one of your own collections. 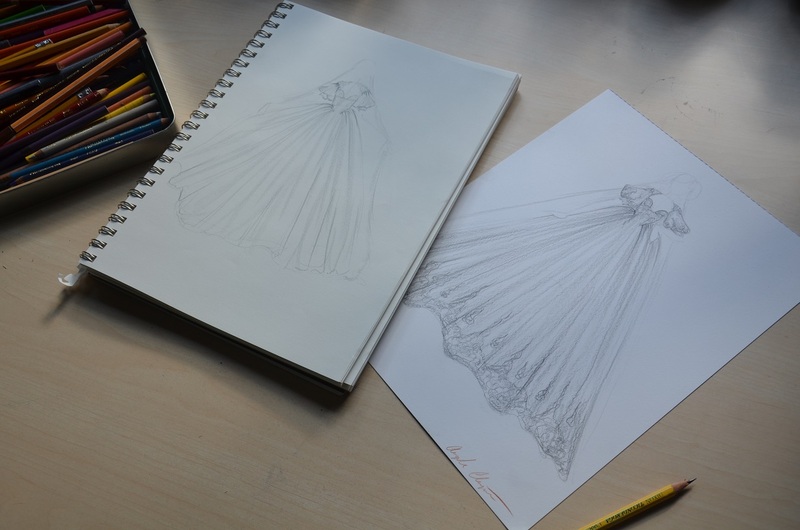 Looking at about $4000 of material costs to make the dresses, so funding it myself isn’t an option right now (nor will it be in the next few years). Maybe some day! 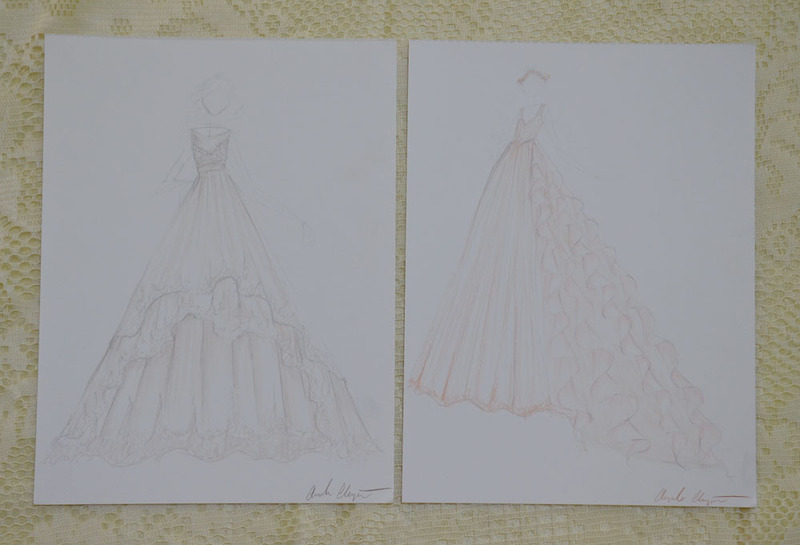 These are really beautiful sketches, they seem very well thought out! 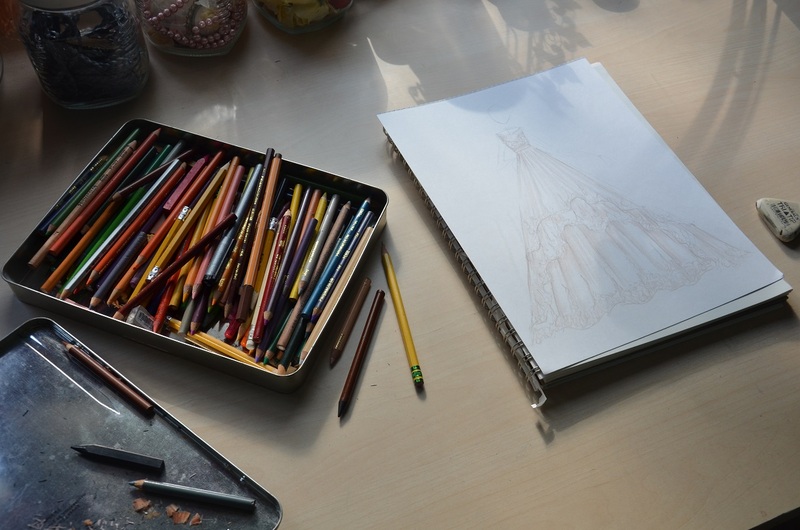 I’m sure you will make an exceptional designer someday!